We’ve now been cruising for over four months, and we’ve pretty much lost track of time and dates. Every day is a new adventure and we think in terms of tides and currents, winds and wave heights, fuel and provisioning. Since we last posted we have found the Alaska that we were eager to see. I’m not sure how to share all of our latest escapades, so I’ll try to give you a front row view of the highlight reel! We’ve lost track of how many bears we’ve seen, but it never ceases to excite us! 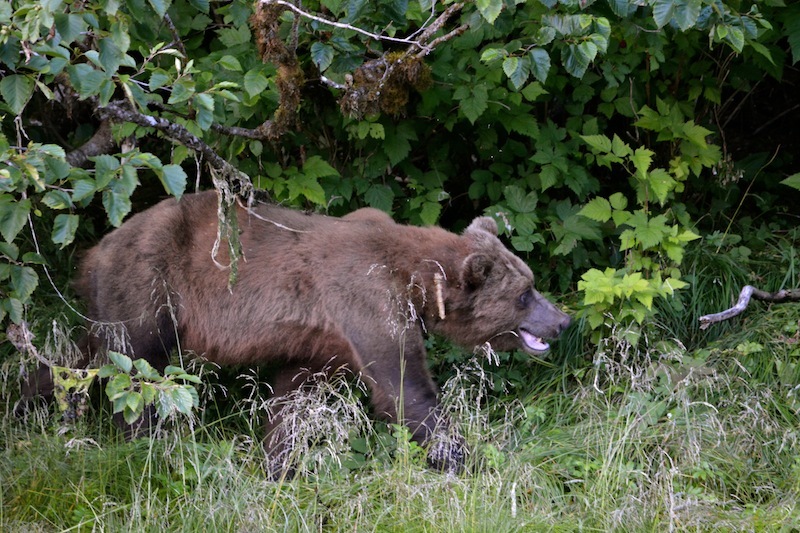 A couple of the best sightings have been in Red Bluff Bay where a young grizzly came by every day while we were there. It was a beautiful anchorage with a river running into the bay across a wide grassy area. The water was shallow along the shore so the bear would wade out and sometimes get neck deep in the water, then stand up to see the fish, and pounce! He usually came up with a fish in his mouth. It was a riot to watch him running through the shallows in search of his next treat. 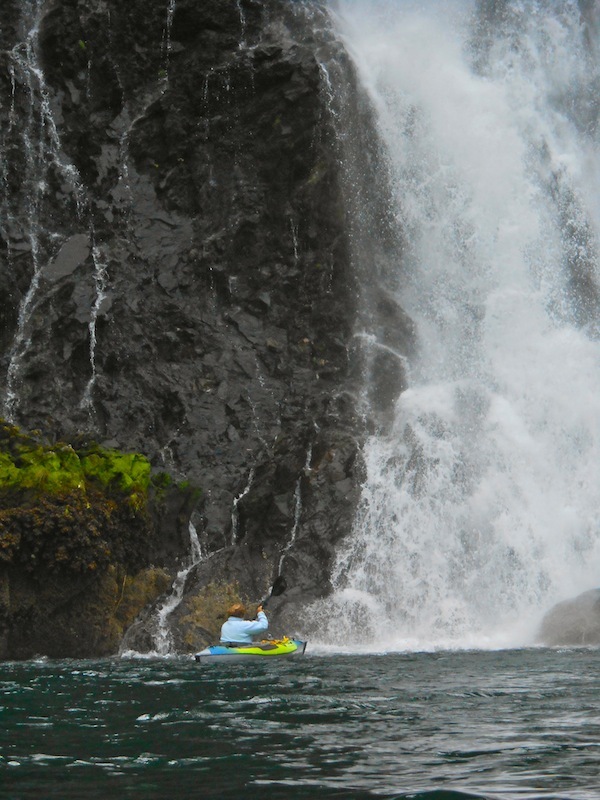 I went out in the kayak one day so that I could get closer – amazing! 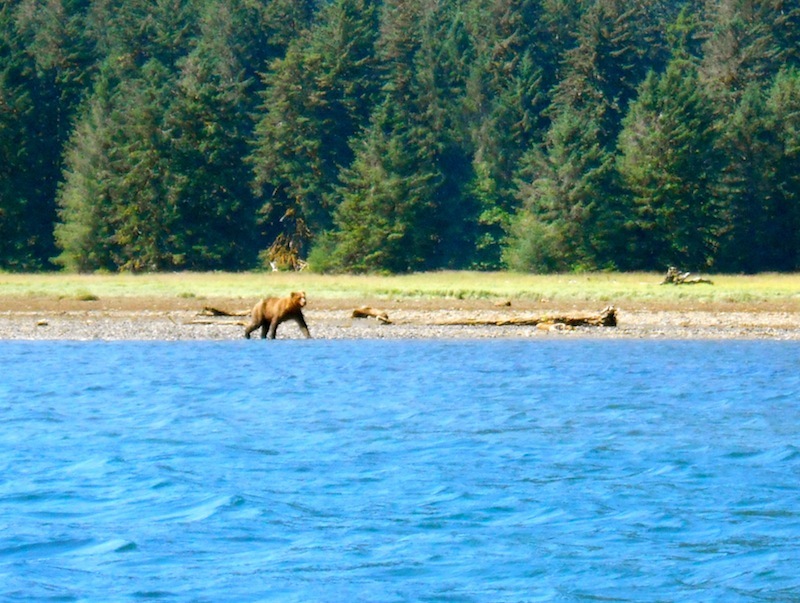 Our other great grizzly sighting was when we were having friends over for a salmon bar-b-que on Happy Dance. We were stern tied to the shore which means that our cockpit was less than 50′ from shore. The six of us were sitting in the cockpit about to eat dinner when one of the other boats in our group radioed us to tell us to look behind the boat. Oh my! The grizzly was on the shore VERY close to us and sniffing the air to see what was for dinner! Thankfully he was in the mood for blueberries, not sailors or salmon, so he walked leisurely along the shore pulling all the berries off the bushes and putting on quite a show! 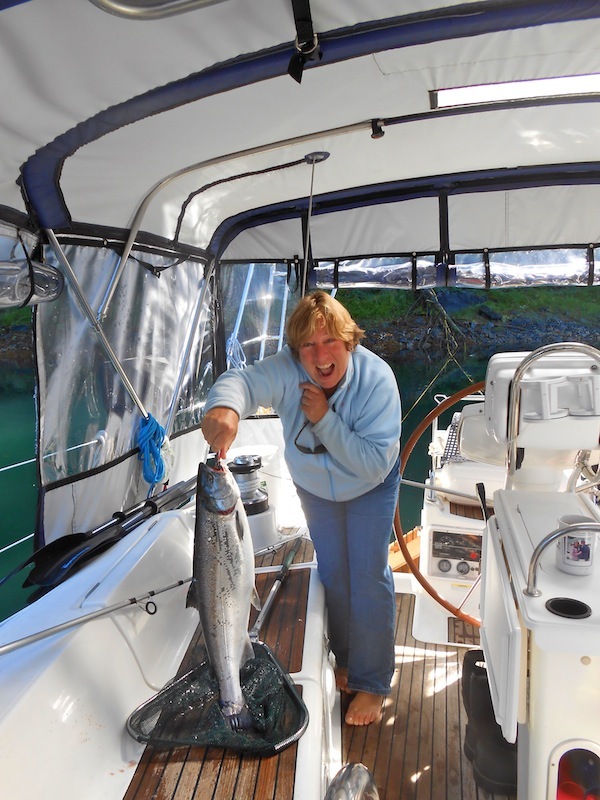 It was amazing to say the least – to sit on our boat eating silver salmon that we’d caught that day followed by wild blueberry cobbler and watching a grizzly enjoying his own after dinner bluberry treat! We have learned to fish! There is of course lots left to learn, but we’ve now caught 3 silver salmon, 5 pink salmon, a red snapper, and a bunch of good sized rock fish. My favorite way to fish is from the kayak, but I know that it’s only easy here because when we’re in these bays with rivers flowing into them, the salmon are thick and very visible! 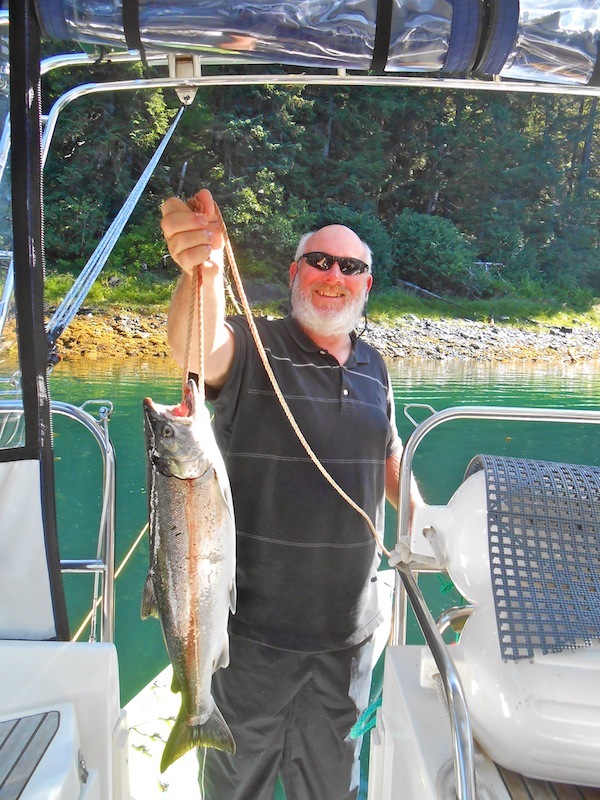 In Red Bluff Bay, Warm Springs Bay, and in Pybus Bay we have been able to pretty much cast a line into a school of salmon and pull the lure through them until one grabs hold. 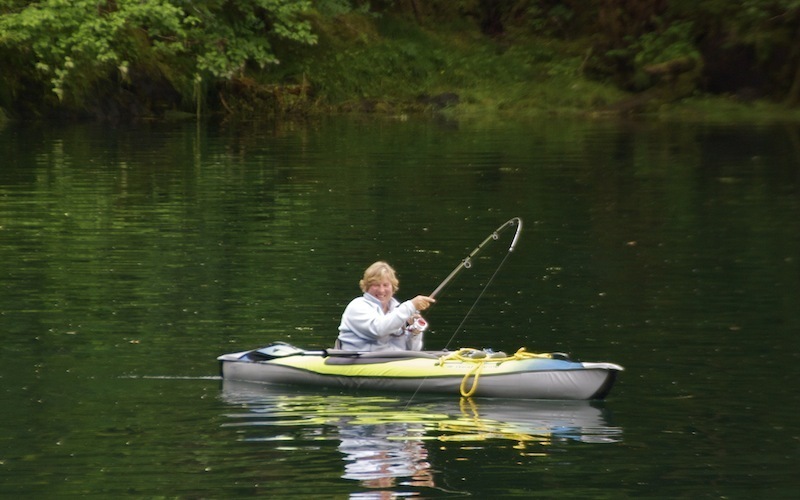 The funniest moment was when I caught my first humpie (pink salmon) from the kayak. I was just paddling around our boat where this HUGE school of candlefish were enticing all the salmon and a couple of seals. When I hooked the first fish it tugged really hard and off I went for a ride as the salmon pulled me around the bay in my kayak! I was laughing so hard I could barely hold on to the pole. When I was finally able to bring him alongside the kayak I then had to figure out what the heck to do with him. 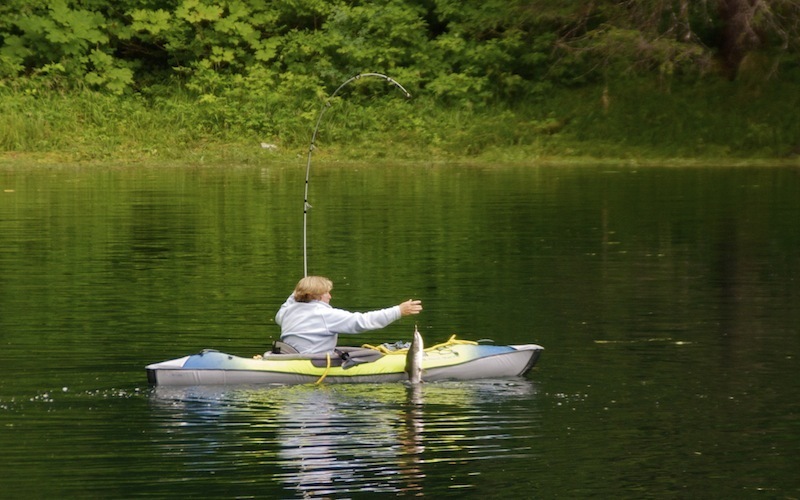 So, in the order of “sailors make it work”, I lifted the pole and grabbed the salmon and held it between my knees in the kayak while trying to get the hook out of his mouth. Did I mention that he’s really jumpy and slimy and slippery and bloody?? Long story short, I caught a second humpie with one in the kayak already jumping around between my legs…I know, I know…too many jokes…haha! 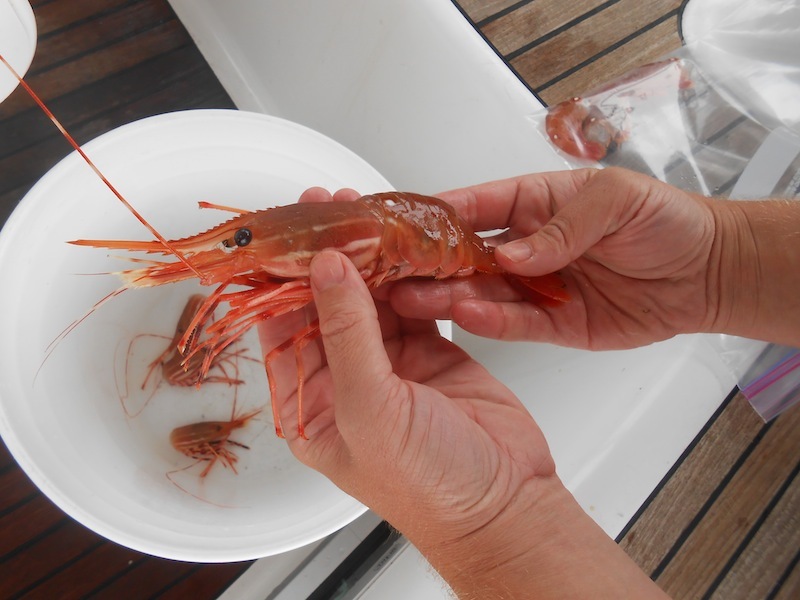 We finally pulled up shrimp (about 40 big ‘uns!) 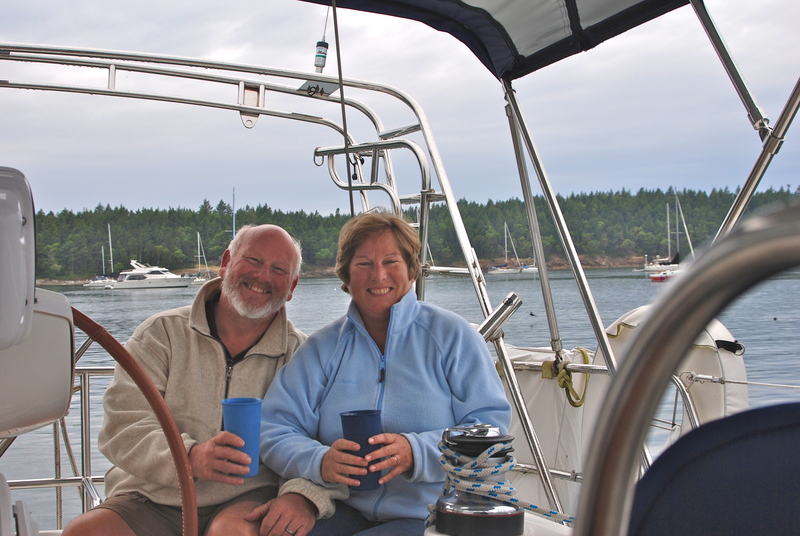 when we put the pot down in 300’ of water just outside our anchorage in Cannery Cove. We’d been skunked the previous times we’d tried, so it was very exciting to see “pink” when the trap came into view! We enjoyed a dinner of peel and eat, followed by shrimp and crap fettucini…YUM! 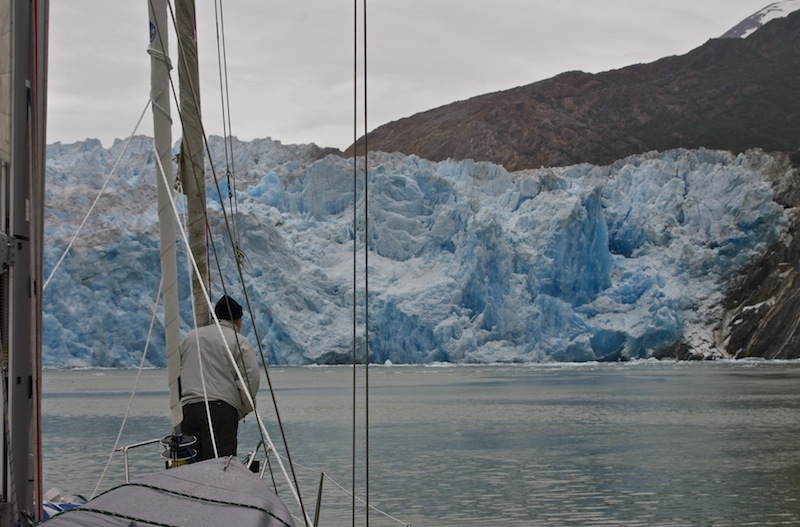 Sailing in Alaska definitely brings it’s own set of challenges. Having sailed in the NW we are familiar with tides and currents, but up here it’s just like everything else Alaskan – it’s bigger! Twenty foot tides twice a day is the norm, and that makes for some dicey passages. A couple of exciting moments come to mind…. One day we were the first boat to reach the planned anchorage, called Hole in the Wall. It is a small bay that is reached via a very narrow, shallow entrance. We put the anchor down and waited for the rest of the group, but as the tide went out it became obvious that not everyone would fit in the bay without some major planning, rafting, and stern tying. Since we’d already anchored, we decided to stay the night while the rest of the group went on to the next bay where there was a dock to tie to. The bay was gorgeous, with a huge meadow, river, and drying tide flat. When the tide went out we watched 5 bears on the beach, including a grizzly, all fishing in the river and pretty much ignoring each other. The black bears did seem to give the grizzly plenty of space though! There were also over a dozen eagles on the beach and in the trees. Listening to all the eagles call, and watching the bear show was awesome! We slept well, but the next morning provided yet another….navigational challenge! We timed our exit from Hole in the Wall to go during a rising tide, about 2 hours after the low tide. The chart reads 6′ in the lowest section of the channel and it was a negative tide, so we had to wait until we were at least at regular tide levels as shown on the chart. The channel is a narrow one, with rock walls on either side and no room to turn around if (when) things get exciting. Since I’m spending all this time explaining the situation, you’ve probably already looked ahead to know that yes, we touched bottom. As we motored slowly out the channel, we were followed by three eagles flying close to the boat, and we were maneuvering in about 1.5 knots of current running against us. Marty was on the bow watching for rocks, and I was keeping the boat moving slowly foward while watching the depth. As we got to the diciest section, the depth sounder went from 9′ to 7′ to “uh oh, put it in reverse”! There was a ridge of rock and sand that was blocking the exit. We backed off the speedbump and then had to do some quick maneuvering to make sure that the boat didn’t turn sideways in that narrow channel. We dropped the anchor in about 7′ of water (we draw 6.6′) in order to help keep the bow centered, and I kept the throttle engaged just enough to keep the boat moving through the water in order to counteract the current that was trying to push us back down the channel. It was challenging, but we held fine for the HOUR that it took to wait for the tide to rise enough for our exit. We each had a mark on shore that we watched so that we knew how much the water had risen. When we couldn’t see the bottom anymore and we felt it was time for another try, Marty pulled the anchor and we slowly (very slowly) motored out. It was quite a relief to get to the other side of the hump and see double digits again on the depth sounder! And then just to keep our adrenalin running high, a little while after we left the bay we hit a deadhead log (one that floats just under the surface so it’s nearly invisible) while traveling at 8 knots. The sound of a log bouncing along the hull is NOT a good one. Another navigational challenge (or nightmare) was in Rocky Pass. This is a long pass that is aptly named, however it might better be called Rocky/Kelpy Pass. There was so much kelp that at times we could see the bow of the boat drop as the kelp wrapped around the keel. We had to stop a number of times in order to clear the prop of kelp too – all while trying to keep the boat in the narrow channel and work against the current that was running. Devil’s Elbow was an exciting point, where the current wraps around a sharp corner and creates a pretty good sized rapids. 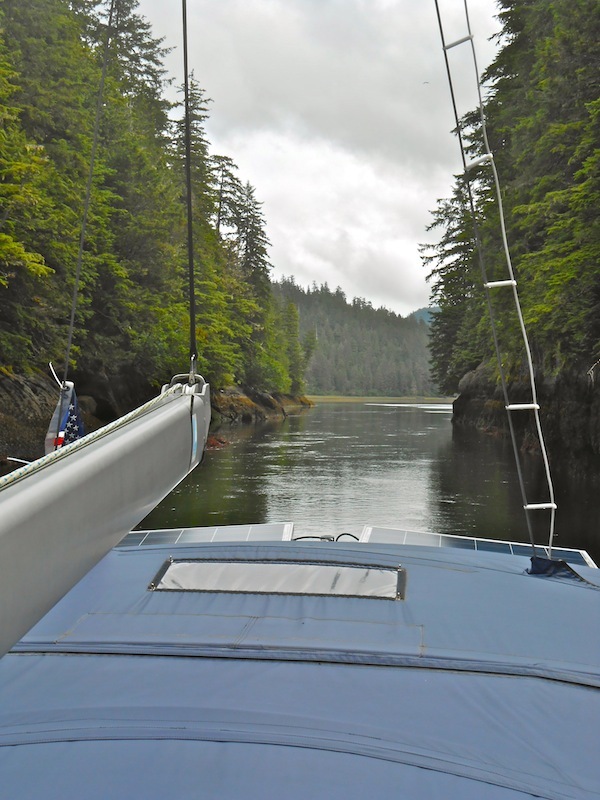 After passing over 60 channel markers in the narrows, we finally reached our reward; another beautiful anchorage, and our third fish camp, where we smoked over 20 salmon! We have seen and felt a bunch of waterfalls, some with mist so thick that it’s like having a bucket of ice water dumped on your head! We kayaked to the falls in Red Bluff Bay that fall all the way from the top of the cliffs, about 2500 feet. The current outflow at the base where the falls hit the bay is pretty wild. 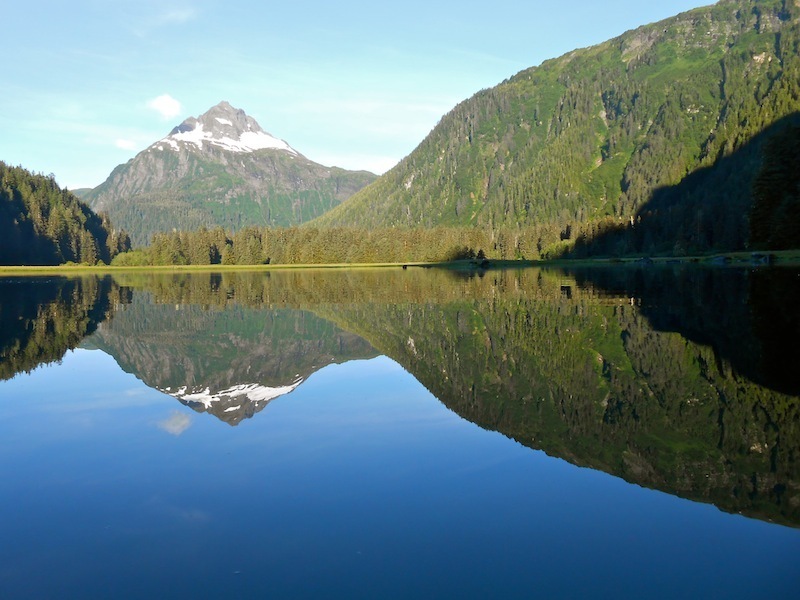 The river that flows into Warm Springs Bay on Baranof Island is stunning. The falls flow right into the bay from the huge lake above, and along the way provide some awesome hot pools. Look who came to visit in Warm Springs Bay!! 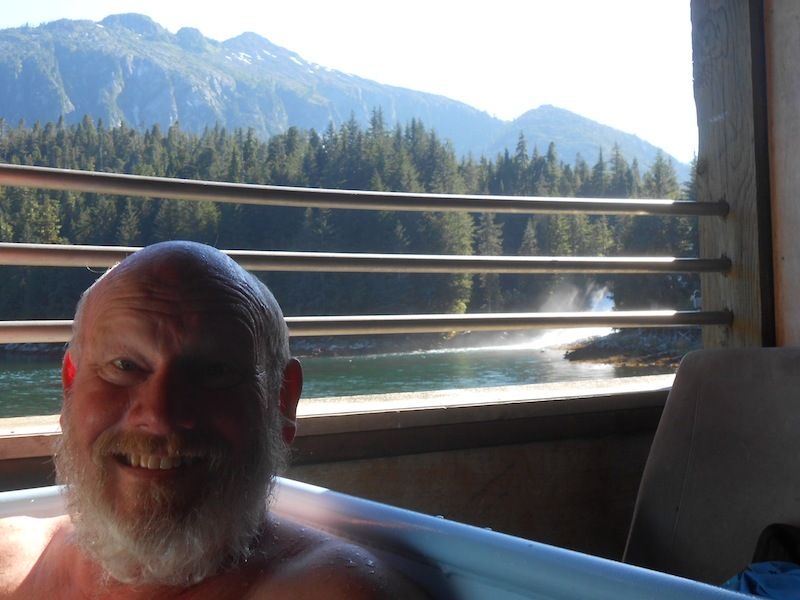 In Warm Springs Bay we were also able to enjoy a long hot soak in the natural hot springs that are gravity fed into tubs looking out over the bay. Definitely an AHHHHH moment for two sore sailors! We reached the furthest point north that was planned for this trip – Latitude 57.56 N! Almost made it to 58 degrees north, but there was a rather large ice cube blocking our way. We anchored in Tracy Arm after sailing all day up Stephens Passage. It was a great day of sailing, going 8 knots with only the blue goose flying, then when the wind built later in the day we flew just the genoa and made great time! Once across the Tracy Arm bar we started to see icebergs floating in the bay – wild! The next day we headed up to the Sawyer Glaciers. The rock cliffs and snowy peaks on the 20 mile trip to the glacier were stunning. 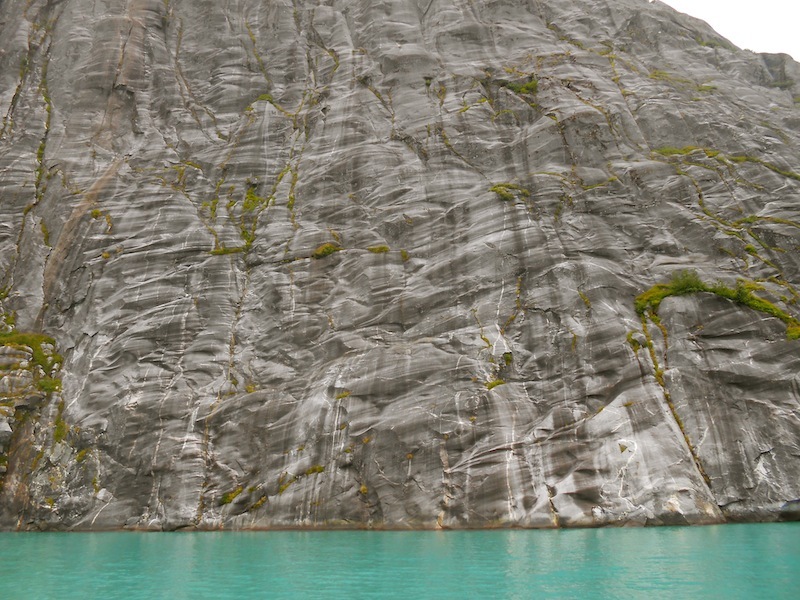 You could see in many places where the glaciers had literally carved and polished the rock faces. When we rounded the last bend and saw the wall of blue ice for the first time – WOW!!! Hundreds of feet high, colors in all shades of blue, bits of ice floating around us, seals floating on the icebergs, and the sounds of ice cracking and crumbling….indescribable. We floated around for quite awhile, listening and watching, collecting bits of ice for our afternoon cocktails, and just enjoying the sight of something so huge and powerful. The chartplotter couldn’t figure out where we were, and showed that the boat was over the land. We visited both the North and South arms of Sawyer Glacier, and when we were in the North arm, we actually touched bottom for a second. The depth was so flukey from all the silt and rubble that the glacier washes down into the channels. We would go from 400′ of water to 10′ in a very short distance, and the water was thick – it was truly like looking through a glass of milk – impenetrable. Seeing, touching, hearing, and tasting the glaciers was a definite high point of the trip. It’s a moment that I doubt we’ll forget! 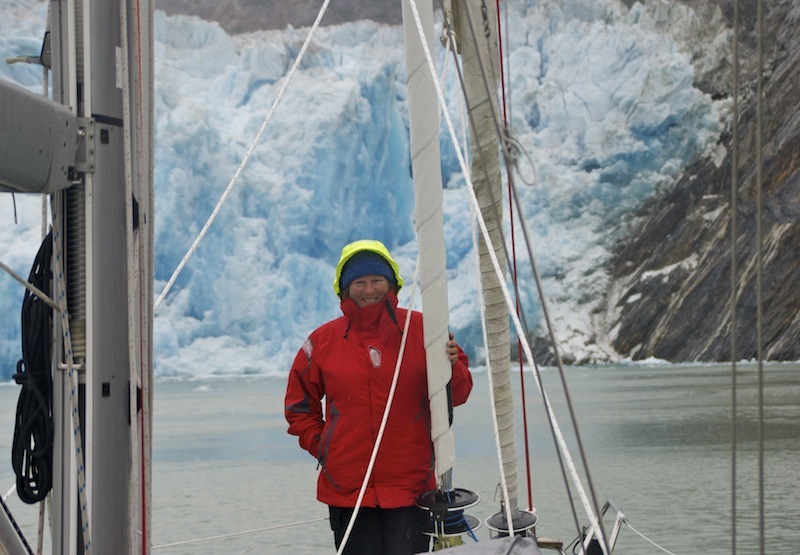 Once we left the glaciers we motored back to the anchorage in a pouring rain, then we all got together on three of the boats that were rafted up, and had our 1 million and 10 party! 1 million old ice with 10 year old scotch…wild! It was great fun to share a yummy dinner with everyone after such an intense day. Cruise ships that go bump. We’ve had two close encounters with cruise ships on this trip. This last one was at 530am as we crossed the Tracy Arm Bar! We pulled anchor at 5am in order to make the 75 mile leg to Petersburg. As we turned on the VHF we heard the Celebrity Soltice calling to advise that they would be crossing the bar heading North at 530am. We could see them in the distance, and wanted to get across the bar (no room for both of us!) before they arrived. With the current running hard with us, we were going 10-12 knots as we crossed the bar and headed as far away from the ship as as we could get. Even with a couple of miles between us, the wake those guys put out is enormous so we take them very seriously. The rest of the fleet in the anchorage were awakened rather rudely when the cruise ship’s wake hit them! Other things that go bump. Have you ever smelled a whale? Really bad fish breath! Sometimes we have been sailing along and smell a sleeping whale before we even see it! It’s a little unnerviing to think you’re coming up on a log when all of a sudden the log spouts a big blow and dives!! 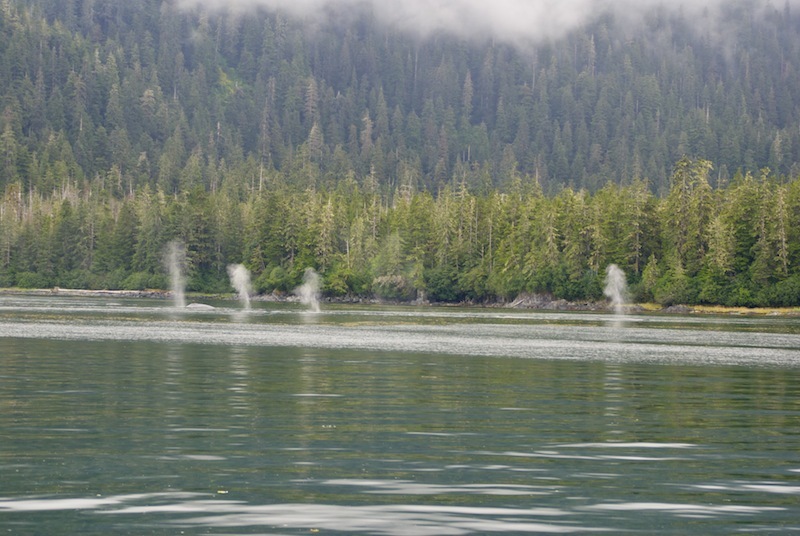 On our way from Tracy Arm to Petersburg we went through Frederick Sound which has one of the highest humpback populations in the area. We lost count of how many whales we saw, and how many times we got “mugged”, having to turn off our engines because the whales were all around us. 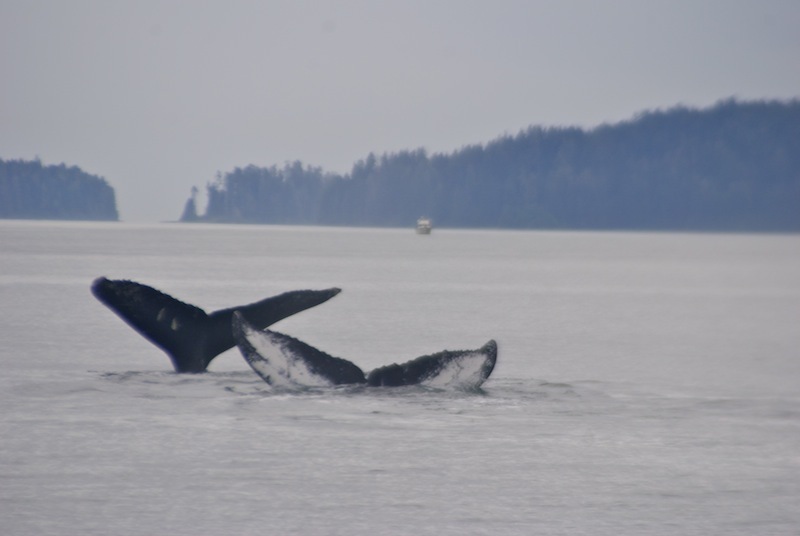 At one point we were in a pod of humpbacks, where there were at least 8 or 10 whales traveling very close together. A couple of breaches, but mostly tail flukes and blows. When we float with the engine off, it’s awesome to hear the blows all around. Well I think that about covers the highlights of the past few weeks. We are now in Petersburg on a beautiful sunny day, watching the fishing fleet come in because the season ends today. This is a crab, salmon, and halibut canning location, and the smells in the air sure make your mouth water! We’ll reprovision, fill the tanks, and then start moving south. All is great on Happy Dance and we continue to thank our lucky stars for this incredible adventure. shoot – you missed us on the Solstice in Tracy Arm by only 2 months, LOL! I know, very vividly, where you were and it’s fun knowing we saw some of the same things. 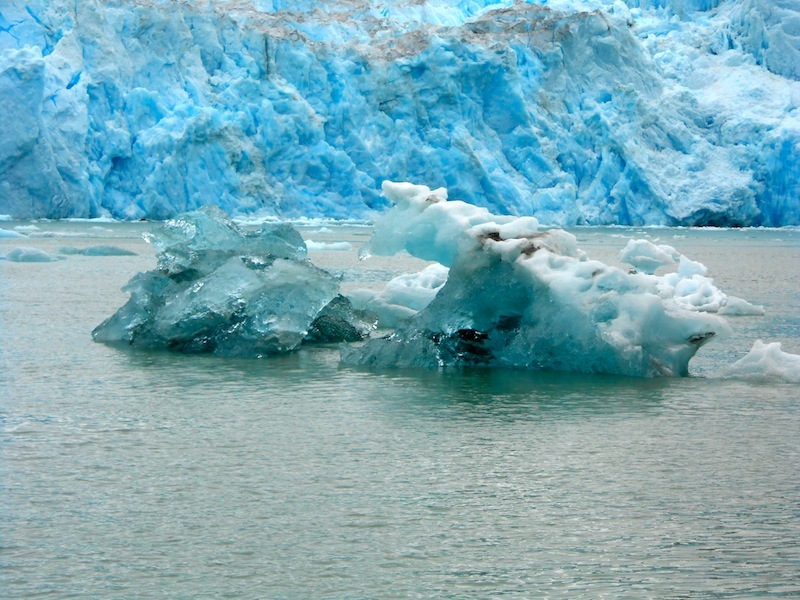 We were also awed by the beauty of both of those glaciers and that beautiful milky blue water. When the ship stopped to view the glacier we were part of a very small group that left the Solstice and boarded a much smaller boat to get closer to the glaciers. 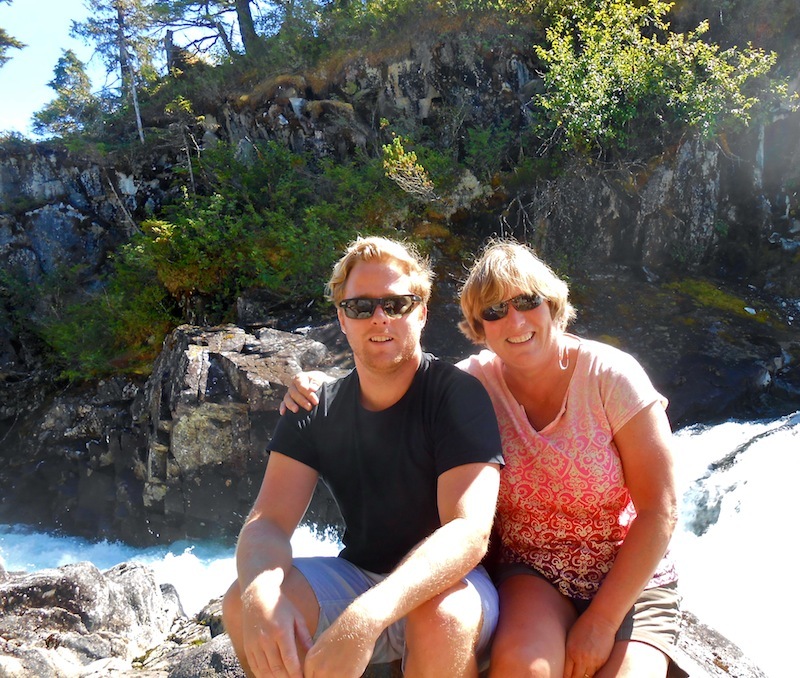 Being down at the water level is certainly a different experience than up on the Lido Deck! I suspect you felt the same awe we did as we felt very small and humbled by the forces of nature that create something so stunning. Congrats on the fishing successes. Should I look for a book about 1000 ways to prepare salmon? Ha, good thing you guys like fish. Funny story about you taking a trip around the bay under salmon power. Thanks to the photos I could easily imagine the whole adventure. It’s so much fun to see the pictures and feel a teeny bit like we are there onboard with you. As always, keep up the fun, take a few thousand more photos and travel safe. I’m impatiently wait for the next update! Hey guys…I’m still keeping your Campbell River slip warm! And thoroughly enjoying your posts; they are so well written, but leave me conflicted! On the one hand I feel this big draw to head north, but on the other hand I feel like I’m already up there with you! Keep the news flowing….